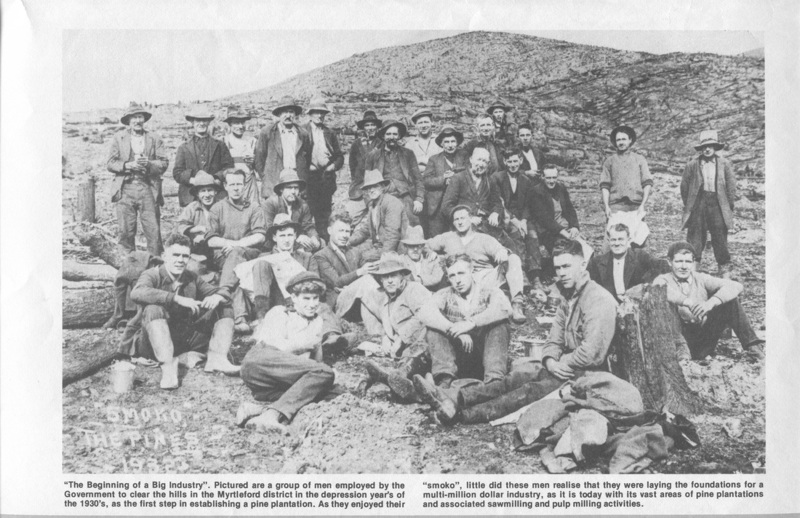 Without doubt, the first agriculture in the Myrtleford area would have been vegetable and fruit growing, mainly by the Chinese members of the mining community. This image shows AH YET, market gardener, who grew vegetables on the south-east side of town in the vicinity of the Happy Valley Creek and Myrtleford Butter Factory. He brought vegetables for sale into town in baskets on his yoke. On his return trip he carried manure and straw from the stables at Rayner’s Bakery, so kept them in a clean condition. Ah Yet, age unknown, was buried at the Myrtleford Pioneer Cemetery in 1929. The Myrtleford Butter factory Co-operative Co. Ltd. was formed in 1903, following introduction of hand separators in 1900. For over 50 years the factory updated the equipment to process cream into butter, ice making and cold storage. In the 1950's new offices and a boardroom were added and the company won the "Orient Prize" for butter in 1956 and 1957. Amalgamation with the Milawa Co-op in 1963 created the Milford Co-operative Dairy Co. Ltd. Milk supplies came from the Ovens and King river valleys, and beyond. With 800 farms annual butter production reached 3,000 tons. By 1966 butter production had ceased at the Myrtleford plant. In about 2008 the old factory was converted into a successful cafe. Hops were grown in the Ovens Valley from the 1890s. The Pan Look brothers, descendants of Buckland Valley storekeepers and gold buyers, established a fifty acre (20 ha) hop garden at Eurobin in 1895 alongside their tobacco crop. 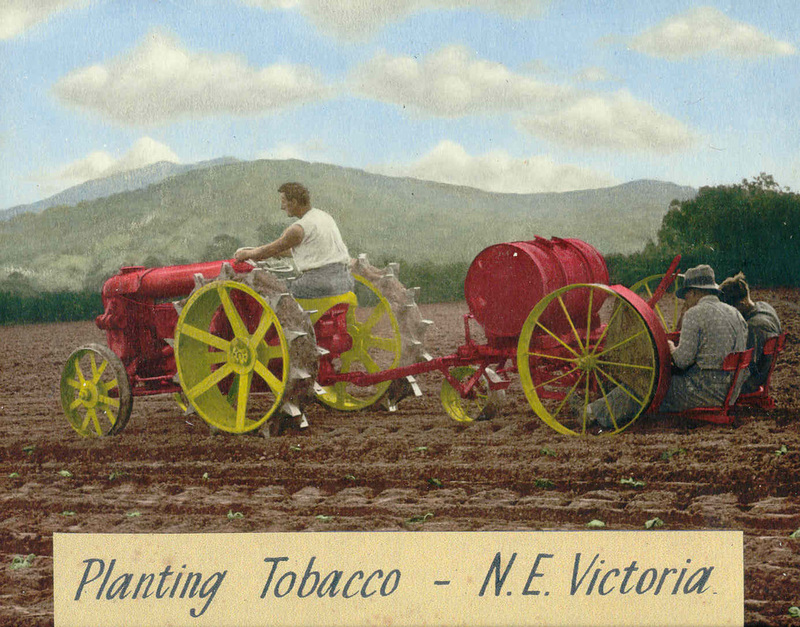 Tobacco crop failure in the 1930s led them to expand hop growing on additional land they had purchased nearby and by the mid-1960s Pan Look’s “Rostrevor” Hop Gardens would be the largest in Victoria. 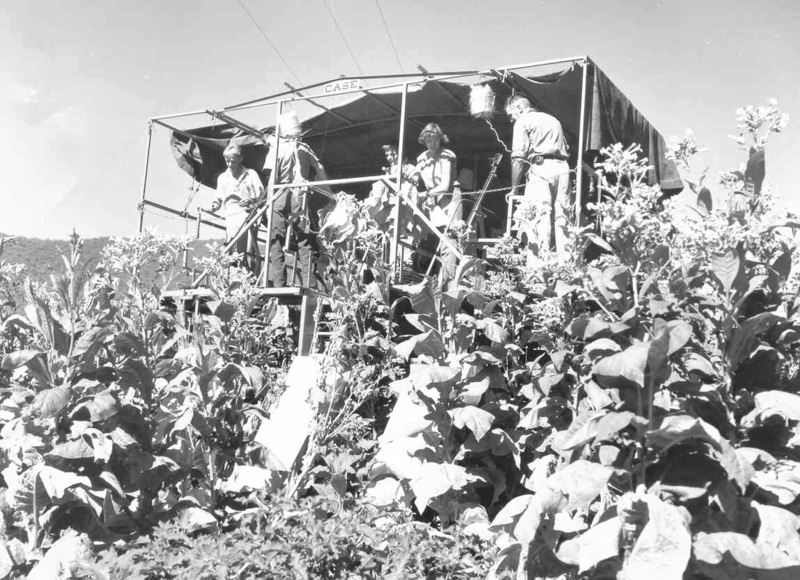 Chinese and American gold miners in the 1850s brought tobacco seed with them to the Ovens Valley and primitive growing and crude curing methods were at first applied to small crops. Mechanical planters and closed-shed curing arrived in the 1890s. The Great Depression stimulated interest in tobacco growing, but a disastrous decade of extremes of climate and poor prices followed. World War 2 saw the industry recover, and the 1950s and 1960s were boom times due to government-funded research facilities, access to plentiful migrant labour, improved grower organization and advances in mechanization and chemical use. The 1970s became the “golden years of tobacco”, but rationalization in the following decades would see the industry finally cease production in 2006. Since the arrival of Europeans in 1837, local forests had been put to use for buildings, stockyards and fencing. Saw-milling began in the using portable bush mills in the Buffalo and Barwidgee valleys and at Gapsted. The largest local hardwood mill was “Valley Sawmills” at Ovens, established in 1945, and when it closed smaller portable hardwood mills continued until the 1980s. Softwood milling has its roots in the recognition that nearby hillsides offered an ideal environment for growing pines. The old canopy of eucalyptus, which concealed old mine workings and harboured infestations of St.John’s Wort, blackberries and rabbits , were turned over to the pine plantations we know today. The first plantings, under the management of the Forests Commission of Victoria, occurred between Myrtleford and Ovens from 1927 to 1935. Plantings at Merriang followed. Clearing and planting crews were a mixture of locals and inexperienced, unemployed city men, many of whom had left families behind to slog it out and live the life of a “susso” during the Great Depression. In response to these first plantings, softwood mills would eventually be established at Myrtleford, Bright, Porepunkah and Stanley. 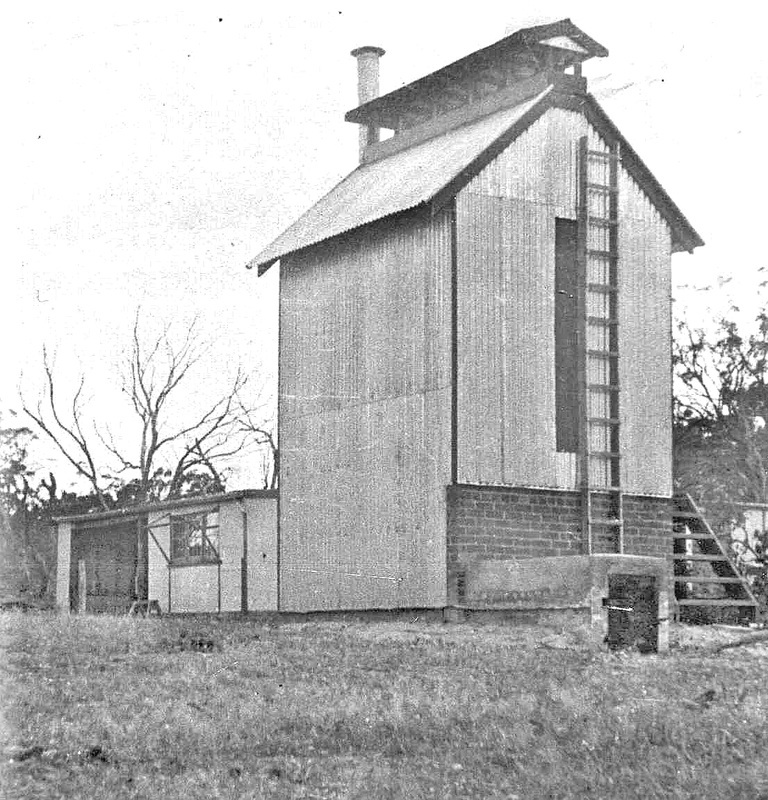 This Mill has long gone now, and has been replaced by a new Mill owned and operated by CarterHoltHarvey Woodproducts Australia. Pine trees being planted in the Ovens area, by men on "susso" (Sustenance) during the 1930s. Although hotels were able to legally sell liquor on the goldfields from 1854, following the abolition of prohibition, it was not until the arrival of a significant wave of Italian immigrants in the Ovens Valley in the 1920s that the grape growing industry took off. Home-grown production was a seasonal activity, embracing festivities, and this tradition continues today. Parallel to this home-based activity was the development of “Cool Climate” wine grape growing over the past 30 years, which replaced land devoted to tobacco growing following the relinquishment of tobacco quotas on local farms. 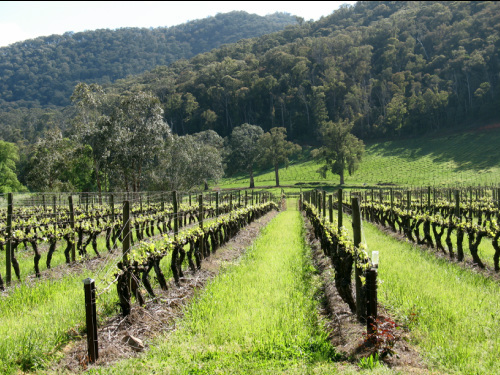 Today, there are approximately a dozen commercial vineyards in the Myrtleford/Gapstead/Eurobin/Porepunkah/Rosewhite area. “Valley Nut Groves” has its roots in the foresight of the two Schlapp brothers who searched the world for walnut varieties which would suit the well-drained river flats of the Ovens Valley from the 1920s. By 1940, the walnut grove would reach 130 acres in size and today continues its standing as one of the largest in Australia. The Flax Mill operated from 1943 until 1968, at Merriang, near Myrtleford. It commenced operations with the express purpose to make linen, from flax, for manufacture of Military uniforms for the War effort. After 1968 the land reverted to tobacco production, and now, for pasture land for cattle. Berries grown in the district include Blackberries (cultivated, thornless), Blueberries, Strawberries and Raspberries. This photograph was taken in Eurobin. Much of the olive groves in the district were developed as a result of the impending demise of the tobacco industry. This photograph is of an olive grove in Eurobin.